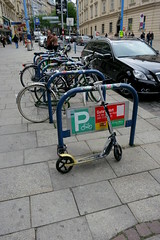 It's important to provide facilities for all forms of human-powered transport. 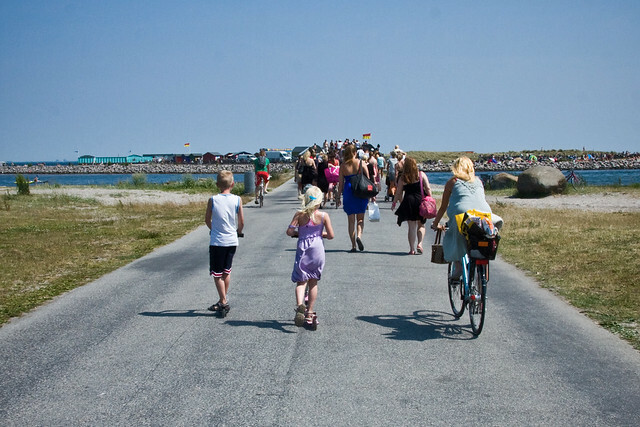 In my neighourhood, many kids live close enough to walk to school, including my kids. 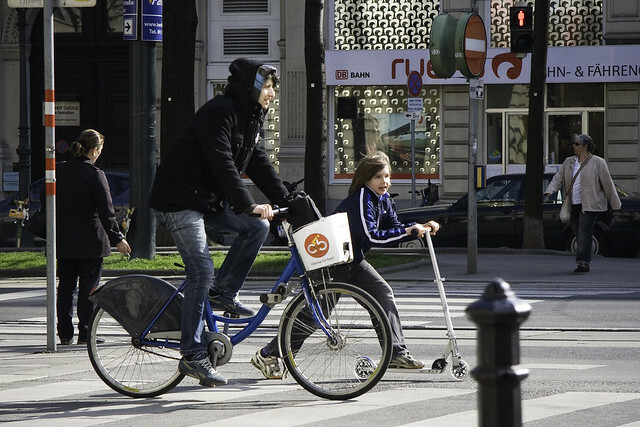 They can and do ride bicycles there, too, on safe, separated cycle tracks, but scooters are a popular option as well. 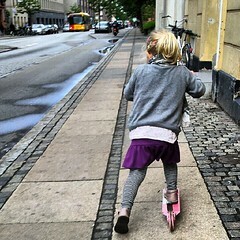 I wrote this article in 2012 but now, in 2014, scooters are still going strong. Whilst in Paris on our summer holidays, my son Felix said, "I love Paris. 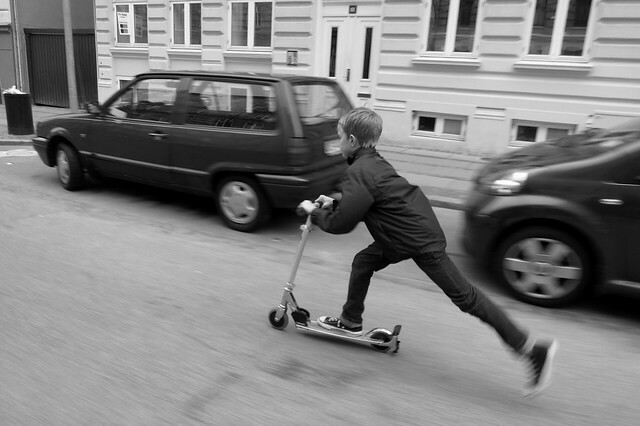 I love a city where a grown man can ride around on a kick scooter and nobody cares." Indeed. 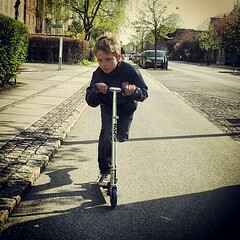 Felix started riding his scooter around the 'hood a few years ago. Disappearing off to football practice or to a friend's house. However, when he scooted to school he came home a couple of years ago saying he needed a padlock to lock it. 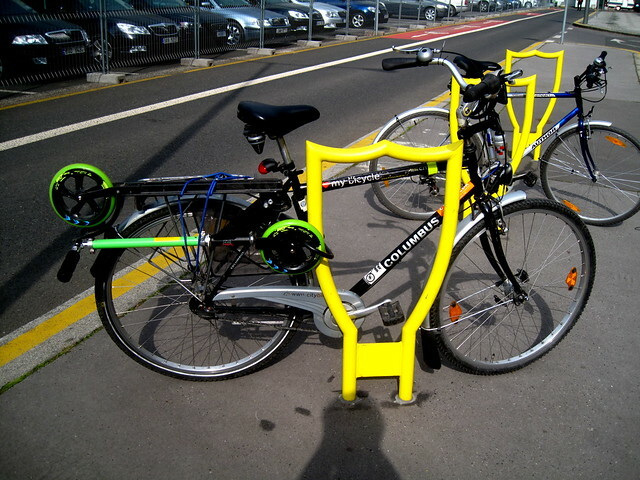 There were too many scooters inside the school - said the school - so a parking rack was provided outside. I didn't really get what he meant until I saw the rack. 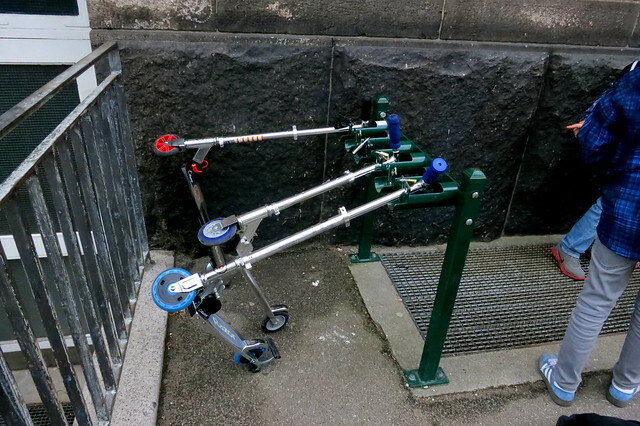 A couple of rows of funky scooter racks have been placed in the schoolyard. You rest the neck of the scooter in the slot and a little bar is tilted down over it. You lock it with a simple padlock. Brilliant and simple solution. There are six slots per rack and three racks in all. 18 parking spots behind the school and 18 more in front. Scooters are quite underrated as transport. They have an air of childishness about them. Playthings. 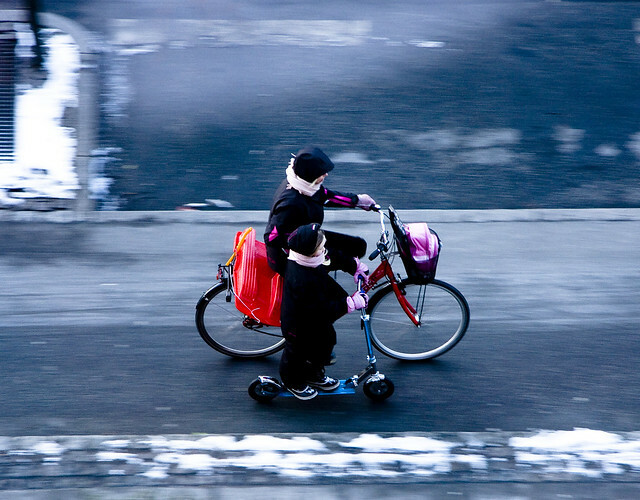 But with so many kids kicking about the neighbourhood I've realised that they are a respectable form of transport in their own right. So certainly facilities must be made available for them. Another place you see a respectable fleet of scooters is at the larger Danish hospitals. And here, as well, parking spaces are provided. 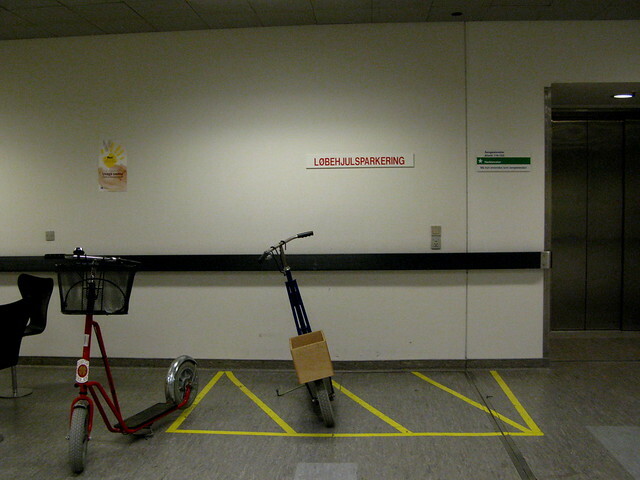 The sign at Hvidøvre Hospital, above, reads, "Scooter parking". You'll see hospital staff, from cleaners to surgeons, rolling along the long halls on their A2B journeys. There are the simple versions like the ones in the photos (I love the little kickstands on both of them) but there are also larger ones for carrying gear, blood samples, medicine, you name it. The Lulu got in on the act early on, as well as The Felix. Heading home from sledding with mum. With a helping hand. 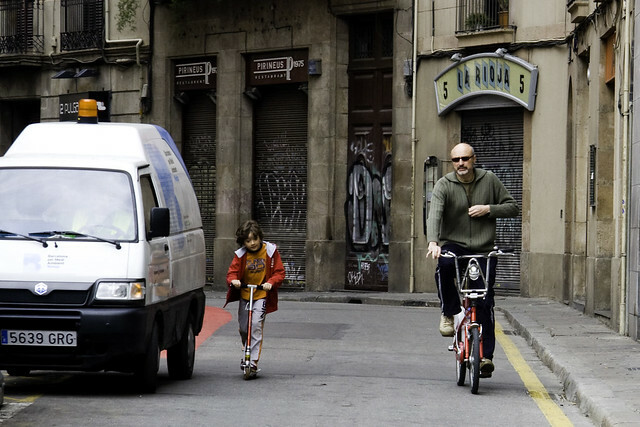 Quiet transport moment with a scooter and a bike share bike in Barcelona. 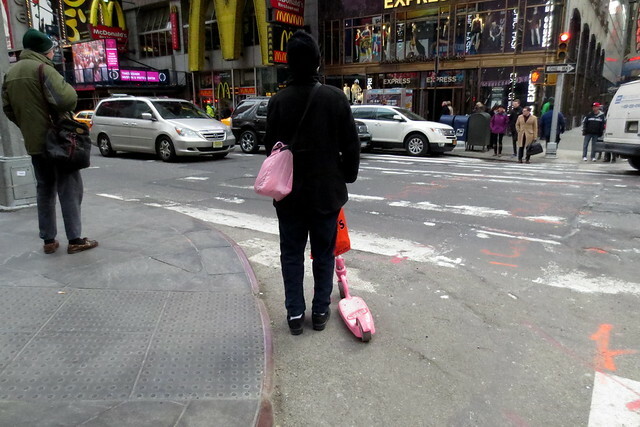 This guy rocked his scooter in New York City.